Linker command failed with exit code 1. This error message is frustrating because it tells you nothing besides the fact the linker command failed. You want to know what the real error is so you can fix it. The first step to fixing a link error is to find out what the real error is. To find the real error, open Xcode’s report navigator by choosing View > Navigator > Show Report Navigator. The report navigator shows recent builds. If you have a linker error, there will be a red icon next to the build, which you can see in the screenshot. 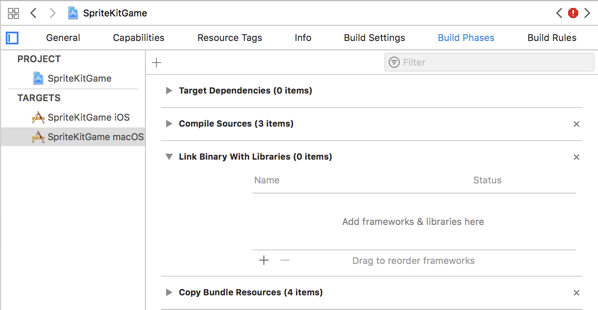 Select the build to see the build transcript, the list of steps Xcode took to build the project. If you have a link error, the build transcript will provide the real error message. Selecting a step from the build transcript makes a little button appear next to the step (The screenshot arrow is pointing to the button). Click that button to see a more detailed build log for that step. The two most common link errors are undefined symbol and duplicate symbol. Make sure you added the library or framework to your project. Make sure the library or framework you added is in the Link Binary with Libraries build phase. If you’re coding in Swift, make sure you imported the library or framework in your code with the import statement. If you’re coding in a language that uses header files, working with header files is another big cause of undefined symbol link errors. Make sure you include the header properly. A common error in C or C++ code is to include a header file that’s not a system header with angle brackets. Xcode won’t be able to find MyHeader.h in this case because the header is not a system header. Use quotes to include the header file. 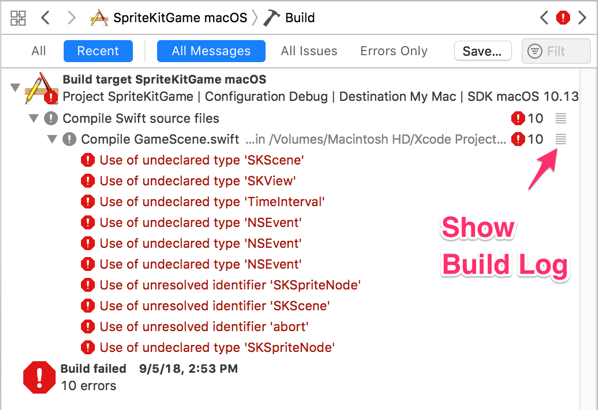 If none of the fixes I mentioned earlier work, you may need to add search paths for the library, framework, or header file so Xcode can find them. Xcode has a Search Paths collection of build settings, which you can access from the project editor. A duplicate symbol error occurs when the linker finds two or more data structures or functions with the same name. People using Xcode to learn C++ can run into this error if they create a command-line tool project. The command-line tool project includes a main.cpp file that has a main function in it. If you add a new file with its own main function and forget to remove the one Xcode created for you, you get a duplicate symbol error. When trying to fix a duplicate symbol error, the first thing to check is that you haven’t defined a symbol twice in your project. Xcode’s find navigator helps you find all occurrences of a given symbol in your project. If you’re using external frameworks or libraries, make sure your symbol names aren’t duplicates of symbols in the framework or library. If you are using custom namespaces in your code, make sure you set up the namespaces properly. In this article you’ll learn about keyboard input accessory views and how to add them to your iOS app to make text editing smoother. Adding a keyboard input accessory view isn’t too difficult. Add a new xib file to your project for the view. Load the view from the xib file. Set the input accessory view to the view you loaded. There’s less than 10 lines of code involved. What Is a Keyboard Input Accessory View? A keyboard input accessory view is a view that appears above the iOS onscreen keyboard. The default iOS behavior is to have no input accessory view, but nothing is stopping you from adding one. A common use of an input accessory view is to show a toolbar with frequently used commands when typing text. The writing app Ulysses uses an input accessory view to insert Markdown characters into the text. If you were writing an iOS HTML editor, you could show a toolbar with buttons to insert the most common HTML tags. Keep in mind that a keyboard input accessory view has type UIView?, which means the accessory view can be any kind of view. The accessory view does not have to be a toolbar. I’m using a toolbar as an example in this article because many apps have a toolbar as the accessory view. The first step in creating a keyboard input accessory view is to create a new xib file and add it to your project. In Xcode choose File > New > File to add a new file to your project. The xib file templates are in the User Interface section under iOS. The empty xib file is the best option for toolbars. If you want a custom view for the accessory view, you can choose View instead of Empty. Take a toolbar (or whatever kind of view you want to use) from the object library and drag it to the canvas. The toolbar has one item in it. Add bar button items to the toolbar to fill the toolbar. While you’re in Interface Builder go to the identity inspector and set the class for the File’s Owner object in the xib file. Set the class to the view controller where you’re going to use the input accessory view. By setting the File’s Owner class to the view controller, you will be able to connect the controls in the input accessory view to IBActions in the view controller to respond to tapping the controls. In the xib file make a connection from the controls to File’s Owner to connect to IBActions. Now it’s time to write some code to load the input accessory view. Call the Bundle class’s loadNibNamed function to load a xib file from the app bundle. Supply the name of the xib file as the first argument. Pass self as the owner argument, and pass nil as the options argument. There’s no more code to write. If you build your project and show the keyboard, the toolbar will appear at the top of the keyboard. I noticed a bug in the iOS 11 Simulator where the toolbar would stay at the bottom of the screen after dismissing the keyboard. I did not run into this issue on iOS devices. If the toolbar is not going away, set the isHidden property of the input accessory view to true when dismissing the keyboard. Set isHidden to false when showing the keyboard. I was recently working on an iOS document-based app that saves the document in a file wrapper. When I looked in the document browser, the document appeared as a folder instead of a single file. 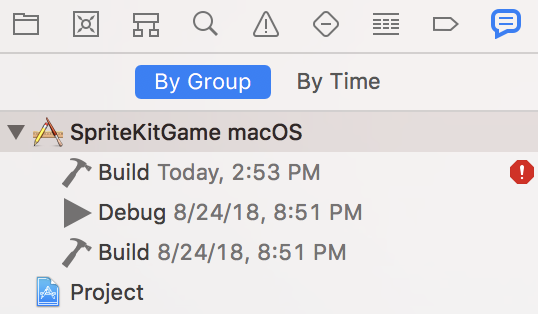 For Mac document types Xcode has a checkbox to select to make the document appear as a single file, but iOS document types do not have this checkbox. How do you make the document appear as a single file? To make the document appear as a single file in the document browser, the document’s exported UTI must conform to the UTI com.apple.package. In Xcode’s project editor, add com.apple.package to the Conforms To text field for the exported UTI. Rebuild your project. Any documents you save should appear as single files instead of folders. Back in 2010 I wrote an article on working with file wrappers. Recently I needed to work with file wrappers, and I noticed the file wrapper code is much different in Swift so I figured working with file wrappers in Swift would be a good topic for an article. This article assumes you’re creating a document-based application. I have only used file wrappers in document-based applications. What Is a File Wrapper? A file wrapper is a bundle, which is a collection of one or more directories that looks like a single file in the Finder. Most Mac applications are bundles. You can examine their contents by selecting an application, right-clicking, and choosing Show Package Contents. When should you use a file wrapper? Use a file wrapper when you want to save your application’s document data in multiple files. A level editor for a game may want to save the level layout, the level’s enemy list, and the level’s treasure list in separate files. The simplest file wrapper is a single directory that stores all the files. But you can create multiple directories to store your files to keep them better organized. There are three tasks to perform to add file package support to a document-based application. First, you must tell Xcode that your document type is a file wrapper. Second, you must implement the fileWrapperOfType method in your NSDocument subclass to save to a file wrapper. Third, you must implement the readFromFileWrapper method in your NSDocument subclass to open a file wrapper and read its contents. You can access your document type from Xcode’s project editor. Select your project from the project navigator to open the project editor. Select the application target from the target list on the left side of the project editor. Click the Info button at the top of the project editor. Go to the Document Types section and select the Bundle checkbox. Now your document will be saved as a file wrapper. To write a document file wrapper, you must override and implement the fileWrapperOfType method. Here is the Swift signature for fileWrapperOfType. The file wrapper fileWrapperOfType returns is the root directory for the file wrapper. Create a directory file wrapper. Get your app’s data into a Data object. Create a file wrapper and add the file to a directory file wrapper. At a minimum you must create a root directory for the file wrapper. To create a directory in a file wrapper, call the FileWrapper method directoryWithFileWrappers and supply an empty Swift dictionary. If you want to add any other directories to your file wrapper, call directoryWithFileWrappers again and supply an empty Swift dictionary. To create a file wrapper for a regular file, call the FileWrapper method regularFileWithContents and supply the Data object that contains the file’s data. Set the filename or preferredFilename property to name the file. In a real app you won’t be hardcoding filenames much. Suppose you have a document that has a list of articles. You would use the title of the article as the filename instead of giving the file a specific name. Remember that you use file wrappers to store multiple files. If you have 20 files to save, hardcoding the name of each file is going to be a pain. After creating the file wrapper, call the directory’s addFileWrapper method to add it to the directory. At this point you know how to write to a file wrapper. The next step is to read the file wrapper. To read the file wrapper, you must override the readFromFileWrapper method. Here is the signature for readFromFileWrapper. The fileWrapper argument is the root directory of the file wrapper. The fileWrappers property contains the contents of a file wrapper. The contents appear in a Swift dictionary, where the key is the name of a file or directory and the value is a file wrapper, which can be either a file or a directory. Make sure the subscript you supply matches the filename or preferred filename you gave to the file or directory. If you make a typing mistake, you won’t be able to read from the file wrapper. The contents appear in a Swift dictionary, where the key contains the name of the file and the value contains a file wrapper. Use the regularFileContents property to access the contents of a file. The regularFileContents property has type Data?, which means it’s either a Data object or nil. By using regularFileContents, you can get the Data object. I ran into an issue with a new document-based Cocoa app throwing exceptions when I tried to save the document. It turns out the issue was the App Sandbox, which is turned on when you create a new Cocoa application project in Xcode. 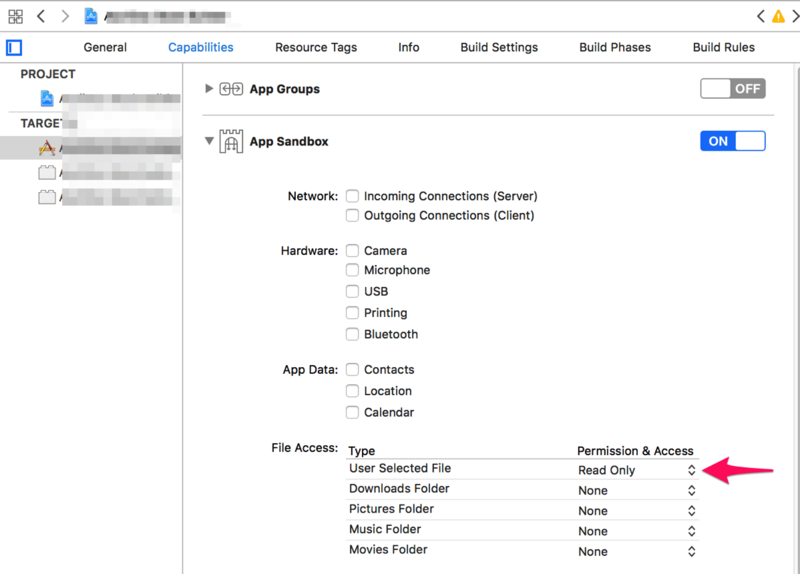 Notice that the App Sandbox initially doesn’t give your app access to anything. It won’t let you print or make any network connections. Surprisingly the App Sandbox does not initially give you permission to open a Save panel to let someone choose where to save a document on their Mac. Apparently opening a Save panel is insecure. Access to user selected files is read only initially. To allow a Save panel to open, you must change the permission for user selected files to Read/Write. If Xcode is throwing exceptions when your Cocoa app does simple things like print, open a Save panel, or show a website in a web view, it might not be a problem in your code. It might be the App Sandbox. There are two ways to work around the App Sandbox. The first workaround is to turn off the App Sandbox. The second workaround is to give your app permission to do things like print and display web content in the App Sandbox. One of the most read articles on this blog is An Introduction to Swift Unit Testing. The article is almost four years old and uses Swift 1. Because of that I have decided to build upon that article here, updating the code to Swift 4 and adding an example project to unit test. I am going to add unit tests to TemperatureConverter, a project that converts temperatures from Celsius to Fahrenheit. I wrote TemperatureConverter as an introduction to Cocoa in my Creating a Simple Mac Application Using Cocoa, Swift, and Storyboards article. You can either go through the article and create the project, or you can download the project from GitHub. The unit-testing branch contains the unit tests. If you go through the article and create the project, make sure you select the Include Unit Tests checkbox when creating the project. You need a unit test target to do unit testing in Xcode. Whether you follow the article and create the project or download it from GitHub, keep in mind that I removed the UI test target in my version of the project. I don’t want the additional target to get in the way. If you download the project from GitHub and keep the UI test target, you may get build errors when you unit test. The errors occur because I set the deployment target of the project to macOS 10.10, but Xcode UI tests require 10.11. Either change the deployment target to 10.11 or remove the UI test target from the project. A test that the freezing point of water is 32 degrees Fahrenheit. A test that the boiling point of water is 212 degrees Fahrenheit. A test for negative Celsius temperatures. You can remove the testExample and testPerformanceExample functions. You’re not going to use them. The setUp function gets called before every test. If you need to initialize some properties before running your tests, put that code in setUp. The tearDown function gets called after every test. If there’s any cleanup work to do after running your tests, put that code in tearDown. I’m not going to use setUp or tearDown in this article. If you don’t see it, add that line of code. You need to import the module for the app so you can access the app’s classes in your unit tests. They start with the word test. Create a view controller because the view controller contains the function to convert the temperature. Supply a Celsius temperature, which will be 0 for this test. Convert the Celsius temperature to Fahrenheit. Perform an assertion that the converted temperature equals the freezing point of water. An accuracy threshold to determine if the two values are equal. Floating-point math can result in values with slight differences, such as giving you the value 31.99999999 instead of 32.0. With a suitable accuracy threshold, 31.99999999 and 32.0 will test as equal. An error message that appears if the test fails. "The freezing point of water should be 40 degrees Fahrenheit. To run the test choose Product > Test in Xcode. The test should fail with an error message telling you that the Fahrenheit temperature is 32.0 degrees. Click the Red icon on the right side of the editor to see the error message. To make the test pass, change the value of fahrenheitFreezingPoint from 40 to 32. You should also change the error message in the assertion to say that the freezing point of water should be 32 degrees. After making the corrections, choose Product > Test. The test should pass. By supplying the value 0.01 for the accuracy argument, the test will pass if the converted temperature is greater than 31.99 and less than 32.01. The second test tests the boiling point of water. It’s going to be similar to the first test. Supply a Celsius temperature, which will be 100 for this test. Perform an assertion that the converted temperature equals the boiling point of water. "The boiling point of water should be 212 degrees Fahrenheit. I have one last test to write for this article. The first two tests used non-negative Celsius temperatures. The last test uses a negative Celsius temperature to see if the temperature conversion works. "-10 degrees Celsius should equal 14 degrees Fahrenheit. I supply a temperature of –10 degrees Celsius, which should convert to 14 degrees Fahrenheit. Three tests do not make an exhaustive test suite. You can practice creating unit tests by adding to the three tests I wrote in this article. I can think of at least two more tests to write: one to test a Celsius temperature that yields a non-integer Fahrenheit temperature and one to test a non-integer Celsius temperature. To learn more about unit testing with XCTest, read the XCTest documentation, which you can also read in Xcode. The Creating Custom Instruments WWDC video is the best guide currently available for creating custom instruments. The Measuring Performance Using Logging WWDC video shows how to use logging signposts to measure areas of your code in a custom instrument. The Instruments Developer Help documentation provides a lower-level reference for creating custom instruments. Is There a More Misused Stack Overflow Tag than Xcode? 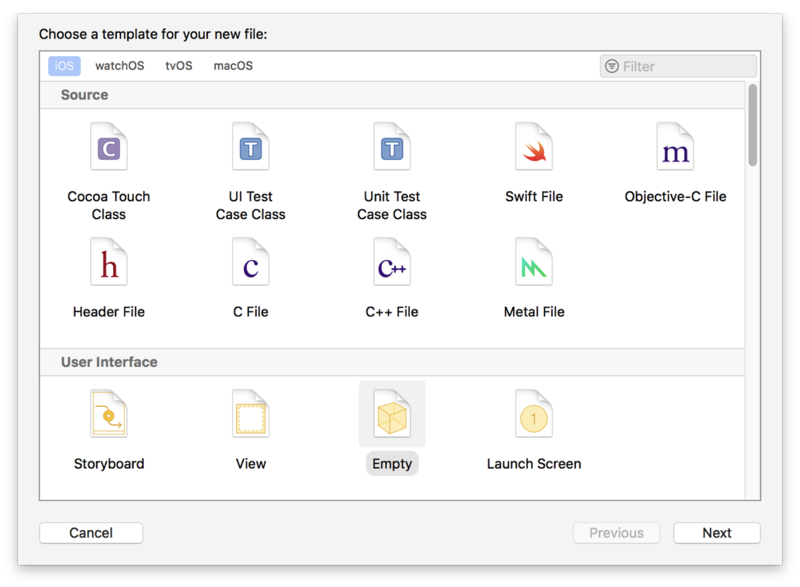 Xcode is Apple’s integrated development environment (IDE). USAGE NOTE: Use this tag only for questions about the Xcode IDE itself, and not for general Mac or iOS programming topics. Use [cocoa] for Mac programming questions, and [cocoa-touch] or [ios] or [Swift] for iOS programming questions. The tag should be used only for questions involving the Xcode tool. iOS development questions should use the iOS or Cocoa Touch tags. But if you read through the questions tagged with Xcode, you’ll notice most of the questions are about iOS development and have nothing to do with Xcode besides the fact that the people asking the questions are using it. What’s the point of having an explanation of the tag if most people ignore it?